The first big scandal of exam season is here. That was the Higher Levels. The Ordinary Levels were asked one entire question about soup. Hazelwood Apprentice Chefs Face Up to the Heat in the Kitchen! Two of Hazelwood College’s talented Home Economics students, Julia O’Doherty and Laura Stack, recently confirmed that they could take the heat in the kitchen, when they wowed judges with their exceptional culinary skills in the Apprentice Chef final held in the Institute of Technology, Tralee. In a hotly contested regional final both competed against six other finalists from schools across Limerick, Kerry and Cork. The students had to create a recipe for a main course using ingredients listed in the “Good Mood Food List”. Marks were awarded on presentation, quality and skills demonstrated, along with a written project. Laura Stack created a mouth watering dish which consisted of crispy chicken with spinach and tarragon stuffing served with roast vegetable filo basket and a bell pepper sauce. Julia’s exceptional win was rewarded with a very generously sponsored prize of €1,000 worth of cooking equipment for Hazelwood College by Lee Strand, a three day internship with Apprentice Chef Mentor Simon Regan at the 5 Star Hotel Europe in Killarney, three cookery workshops with Apprentice Chef Mentor Mark Doe at “Just Cooking” cookery school in Firies, three Innerjoy Wellbeing coaching sessions with Susan Fitzgerald, an Apprentice Chef uniform, kitchen utensils and certificate. 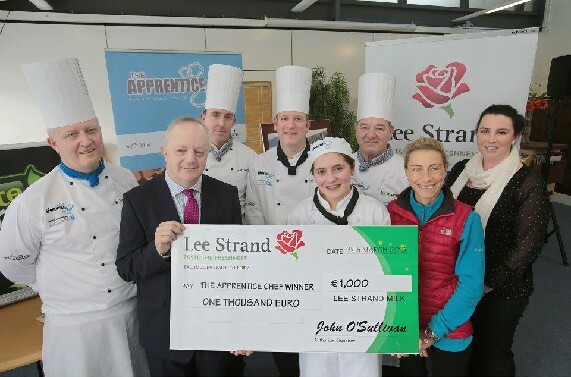 Sixteen year old Hazelwood College Transition Year Programme student, Julia O’Doherty, who was announced as the Overall Winner of The Apprentice Chef 2013. Presenting her with a cheque of 1,000 euros is John O’Sullivan General Manager Lee Strand, from left, Mark Murphy Lecturer ITT, Simon Regan, Chef – Hotel Europe, Mark Doe, Chef – Just Cooking, John Murray Lecturer ITT, Susan Fitzgerald Innerjoy & Wellbeing Coach, Noreen Daly Home Economics Teacher Hazelwood College.